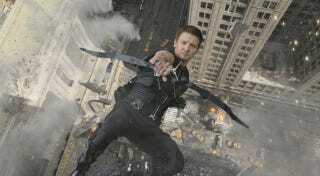 Where was Hawkeye while S.H.I.E.L.D. was going crazy during Captain America: The Winter Soldier? Well, an earlier plan for the movie included a confrontation between Hawkeye and Captain America—one that ended in a very tender and heroic moment. Joe Russo: What it was going to be, we were trying to complicate the relationship between Cap and his S.H.I.E.L.D agent friends. If Hawkeye got a call from S.H.I.E.L.D saying Captain America is a fugitive, would he listen to that call or not listen to that call? That sequence actually was heartbreaking for us to cut it. I think it ultimately might have been a conflict with Renner's schedule. But there was a great sequence where Hawkeye was chasing Cap through Washington D.C. there was an awesome sequence where they confronted each other in a ravine on the outskirts of D.C. and Hawkeye was shooting a series of arrows closing in on Cap, Cap closing in on him. And then Cap took him down and he realized for the first time that Hawkeye was trying to trick S.H.I.E.L.D, where he whispered something into Cap's ear that Cap had a tracker on his suit and to punch Hawkeye to make it look real, because there was a Quinjet hovering above where they were watching the feedback back at S.H.I.E.L.D. So it was a cool sequence. But look, there's a million iterations of films, and especially when dealing with Marvel movies where characters can come in or come out during the creative process. And you keep working and working like a Rubik's Cube till you find the right configuration where everything lines up. So even though we lost that sequence, I think we may have streamlined the movie and made it a little bit more propulsive. Oh well. While it would have been really nice to see more Hawkeye—especially given his relationship to S.H.I.E.L.D. in the MCU—and give him his own pretty perfect-sounding character moment, his absence doesn't detract from The Winter Soldier being a fantastic movie. And hopefully, Hawkeye really will have a more expanded role, and more character development, in the upcoming Marvel movies.